Offer a toast to the brave soldiers of the United States Armed Forces with the military drinkware we offer. Our selection includes patriotic glassware and barware that display the licensed logos of the U.S. military branches. 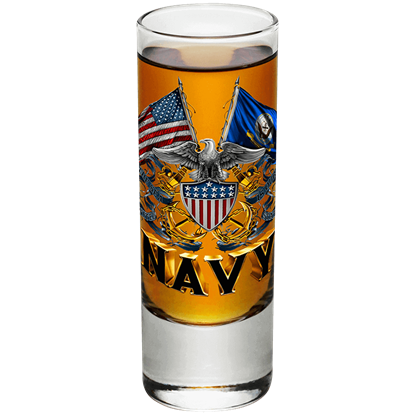 Serve up another shot of whiskey with a shooter glass inscribed with the seal of the Marines. Update your barware with pilsners and tankards that commemorate the U.S. Navy. Send a salute while drinking from a coffee mug that honors the Army Strong. Enjoy a refreshing ice-cold beverage from a pint glass that celebrates the U.S. Air Force. 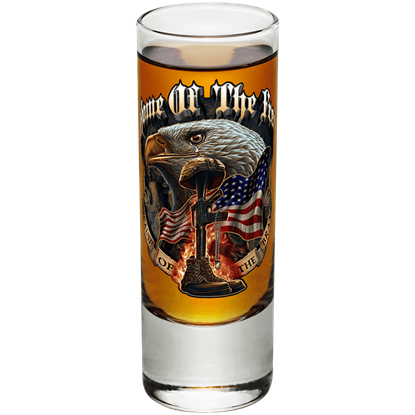 Honor the brave American heroes that inspire you with the amazing collection of military drinkware found here. 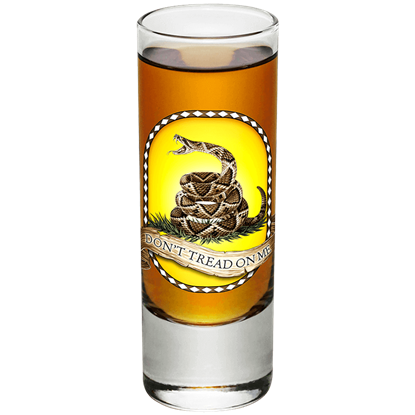 The patriotic symbol appearing on the Dont Tread on Me Shooter Glass originally served as an emblem of the Continental Marines, displaying proudly on their flags, but its meaning still inspires those who fight for freedom today. Thanks to the dedication and sacrifice of American soldiers, both past and present, freedom reigns throughout the USA. Remember those who fought bravely for this worthy cause with the Home of the Free Battlefield Cross Shooter Glass. Celebrate the loyalty and bravery of those who defend our freedom. No need to wait until Independence Day or Memorial Day to honor our soldiers, the These Colors Dont Run Shooter Glass is a patriotic piece for your barware set. 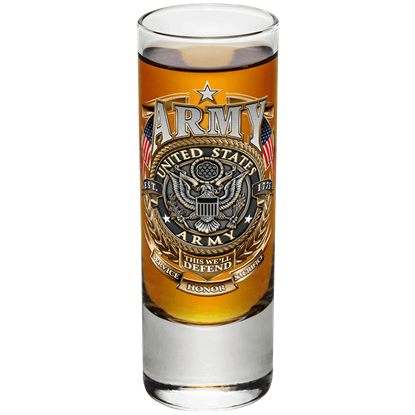 The This We Will Defend Shooter Glass honors the heroic soldiers of the United States Army. Down another shot of your favorite liquor, and offer a grateful salute to the courageous veterans and officers of the red, white, and blue. 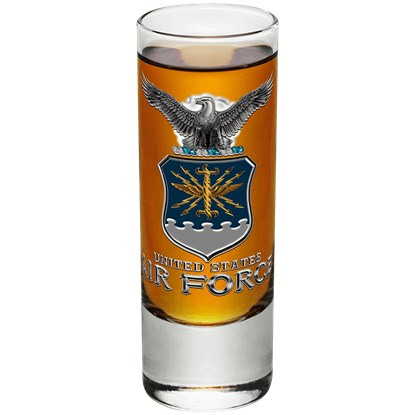 The U.S. Air Force Seal Shooter Glass honors the American warriors who soar through the skies in the name of freedom. Reveal your respect and pride for both veterans and soldiers on active duty with this patriotic barware piece. 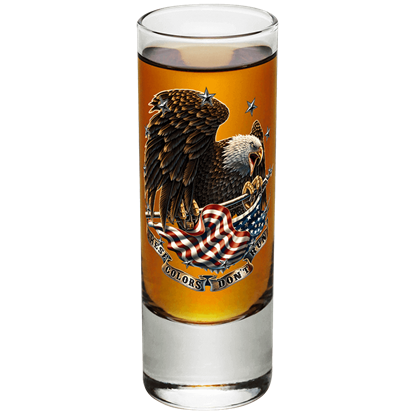 The U.S. Navy Double Flag Eagle Shooter Glass honors the American soldiers who command both land and sea for the sake of freedom. Offer up a salute to these heroes as you down another shot of liquor with this patriotic barware piece.